Welcome to an additional family member – OSMstats : Neis One! Notice: OSMstats was introduced in 2011, this means the webpage cannot provide statistics prior to that year. 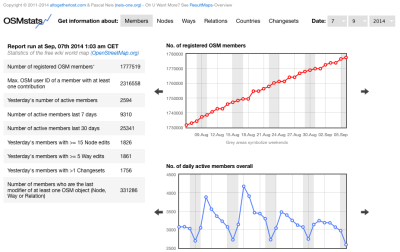 Also, the newly created Changeset-Tab has only data for July, 2014 and after. Thanks for all the lovely stats. It would be useful if the site made clearer the time zone of all the graphs. CET, current prevailing European summer/winter/zone, something else? This isn’t meant to sound rude, but when looking at things like daily ebb & flow of contributions it’s useful to know the time zone of the graphing. I’m not a coder, but it would be awesome if the viewer could set their own timezone so the pulled data could be reset to their local time. If I’m say, in Tokyo then the time in Berlin or Paris has less immediate relevance. thank you very much for your feedback. Tried to add some additional information about the used timezone for the stats (Central European Time (CET)). Hope that it helps, all the best. thx for your comment. Sadly I can’t find any error when I go to the countries section. Maybe do you have an example URL? Got same error as DaCor, here is a screenshot http://goo.gl/DxeqG0. I assume that this problem only exists in the early hours of the day (UTC). Should hopefully be fixed now. Anyway, thx for reporting (again). yes, sadly due to performance reasons, I had to remove the note users stats from #OSMstats. However, will try to restore it in the next version. thank u vermy much for this amazing archiv. I dont want to be greedy, but is it possible to get the raw data, beside reading each value from the charts? I for example would like to get the monthly mean value of daily aktive members to balance the fluctuations. “No. of members who are the last modifier of at least one node”. I would be very happy to compare it with actual values. Especially. Figure 4: Development of OSM Street Network in Germany by Street Category (2007–2011). from the 2012 Article, would be very interesting to estimate the completeness. However, thank you very much for your work. I have another two requests. 1.Can u post the raw data for the “No. of active members last 7 and 30 days” chart? 2. Is it possible to locate the users? I only can estimate how many user come from germany for example. but is it also possible to post a csv with the stats from the node page. “Nodes in the database”, and “daily changes” would be useful. PS: Sorry for bothering you again and again. But I really like your work around the osm-projekt. I don’t know if you often get those kind of requests, but I would be very happy if you go on with your work. Especially your Articles in Future Internet are a pleasure. Wow, that sounded easy. How about centroids or polygons for users guessed home location?